The Iron Chef tells us what he’s loving right now. Chef Masaharu Morimoto—known to millions as the star of Iron Chef and Iron Chef America—has garnered critical and popular acclaim for his seamless integration of Western and Japanese ingredients. He has effectively created a signature cuisine that has gained worldwide appeal and positioned him as one of the foremost chefs today. 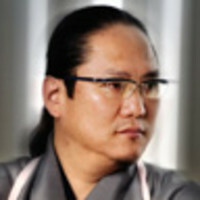 Morimoto is executive chef at Morimoto Philadelphia, Morimoto New York, and Wasabi by Morimoto. In July 2010, chef Morimoto opened his first West Coast restaurant, Morimoto Napa, in downtown Napa’s new Riverfront development, followed by the fall 2010 debut of Morimoto Waikiki in Waikiki EDITION, the new luxury lifestyle hotel being developed by Ian Schrager and Marriott Hotels. Before earning chef stardom, Morimoto was to be drafted as a baseball catcher in Japan’s major leagues when a shoulder injury ended his career. Soon thereafter, he began studying sushi and kaiseki, honing his craft for seven years at an acclaimed restaurant in his native Hiroshima, Japan. At age 24, he opened his own restaurant nearby, and after a successful five-year tenure, the young chef sold it and traveled to the U.S. to further expand his repertoire. In 1993, Morimoto was tapped to head the sushi bar and Japanese kitchen at the Sony Club before being recruited by Chef Nobu Matsuhisa to open Nobu restaurant as executive chef in 1994. Since then, Morimoto has competed on the Japanese television show, Iron Chef and also appears on the Food Network’s Iron Chef America. In 2007 his first cookbook, Morimoto: The New Art of Japanese Cooking, was published and won the IACP award in the “Chef’s and Restaurants” category and “First Book: The Julia Child Award.” It was also nominated for the James Beard Foundation Award. This Italian dish lets the ingredient, which in this case happens to be the ever-divine octopus, be the star rather than some tricky technique. Octopus Galician-style by Mario Batali. I like this recipe because it’s simple and really showcases octopus itself. In a way, it’s very similar to Japanese cuisine: we boil octopus, slice it as sashimi, and eat it with just wasabi and soy sauce. If we use fresh good quality ingredients, we don’t need to use a complex cooking method. At my restaurant, I even serve raw octopus sashimi with just sea salt. I also use a lot of olive oil for seafood cooking, like this recipe. On your next trip to Tokyo venture out in search of some of the freshest seafood at this hidden gem. Kato at Tsukiji Market in Tokyo. This small Japanese eatery is located within the top seafood market in the world, Tsukiji, and serves delicious lunch sets at reasonable prices. It’s always crowded with industry people who come to the market to buy the freshest fish and other ingredients coming from all over Japan. In Kato, my favorite lunch set includes braised golden eye snapper, rice, miso soup, and pickles. Nothing fancy about it, but simply delicious. You don’t need to get dressed up or make a reservation, but go there, get a seat, and eat. Calling all cookbook authors: This is your chance to pen Morimoto’s long, lost guide to “Edo” cuisine. I don’t really read cookbooks, but what I would like to have is a cookbook called Ultimate Cuisine in the Edo Period, in which all kinds of ingredients, techniques, and cooking styles in the Edo era are recorded. Sushi began in the Edo era and is now enjoyed by many people around the world. I’m interested in the period that created the food. Whether you are looking to travel in the name of culinary research like Morimoto, or simply a relaxing vacation, Vietnam will provide the best of both worlds. Vietnam. Its cuisine has been influenced by the French and Chinese, which is very fascinating to me. I would love to go not only to Hanoi but explore the whole country to try different kinds of unique local foods. Since Vietnam is a country bounded by the ocean, like Japan, I would like to go to each seaside town to try their seafood dishes. Chef Masaharu Morimoto—known to millions as the star of Iron Chef and Iron Chef America—is as comfortable cooking against the clock for a live television audience as he is preparing his signature omakase menu at his wildly popular namesake restaurants in Philadelphia and New York, where, through the seamless integration of Western and Japanese ingredients, Morimoto has effectively created his own, unique cuisine.